Update 14 March 2013. The Guardian has released the data on the popes. Its list and mine differ trivially, except that they were able to include the popes’ ages (starting from around 1400). It’s fun to compare the graphs they derived versus mine below. God bless Pope Francis. Update 11 February 2013 (original date: 12 November 2012): Pope Benedict to Resign. Here, for no particular reason other than curiosity and because it’s Saturday, is a brief analysis on how long Popes have served. All data was retrieved from New Advent’s Catholic Encyclopedia. The first Pope, St Peter, a buff fisherman nicknamed “The Rock”, had the longest go thus far, at about 36 years; perhaps not precisely 36 years because of course dates that far back are imprecise. Still, he had a good, long run. The shortest term of office, rounded to the nearest year, was 0 years was by Stephen II in Anno Domini 752, who was made Chief “but on the third day after his election, whilst transacting some domestic affairs, he was struck with apoplexy, and expired on the next day.” And this was in the time before twenty-four cable news programs. This picture shows the frequency of term of service in years (all dates rounded up to the nearest year; so that somebody serving 0 up to 12 months is counted as one year, etc.). 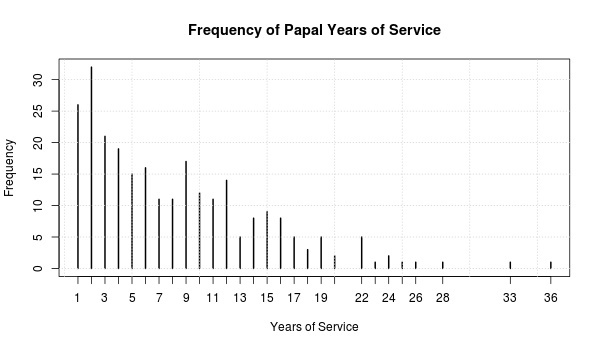 Serving just 2 years was the most common, with about half of all Popes serving 6 or fewer years Pope is a stress filled job, which might be why so many don’t last so long. Blessed Pius IX, with 33 years served from 1846 to 1878 came in second place behind St Peter. Blessed John Paul II was second runner up and sat in office from 1978 to 2005. Lucky us! 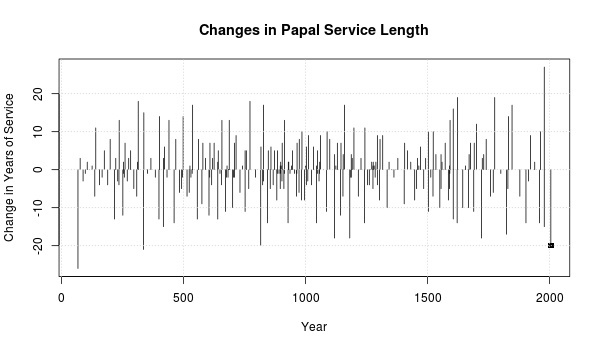 These last two data might indicate that Popes are serving longer terms lately. This next picture examines that. A vertical line representing the years of service for each Pope is drawn at the year in which they began office. Again, St Peter sticks above all the rest. A black dot is indicated for Benedict XVI, as he is still, thank God, beavering away. Update He made it eight years! The plots reveals that after about 1600 or 1700, longer terms of office were more common. Well, no surprise. This is when health took a turn to the north for all mankind on average. Not for everybody, naturally. John Paul I served for only 33 days in 1978. And Pius VIII made it only 2 years starting in 1829. But all the other gents from 1670 onwards cruised through 6 or more years. Things were dicier for Popes between roughly 500 to 1200, but then this was a tumultuous time in history. Somehow, even with diets nearer to what is nowadays close to scientifically said to be ideal, people didn’t live as long as they do now. Science has no answer. Natural comparisons to Popes would be presidents, kings and other leaders of large organizations. I’m guessing the distribution in length of service won’t be too different, especially in those institutions which appoint members for life. I’m still collecting the birth years of the Popes and other information. When I have it (or people can point me to data sources where the collection is already done?) I’ll post new entries. Update Not all Popes served for life, like Supreme Court judges. Example: Benedict IX took his turn in the Chair three separate times (he’s only given one entry for his total above). I wondered whether long periods of service were followed by short periods, perhaps because of institutional fatigue or suspicion. Or maybe the opposite was true and long periods were followed by long periods, perhaps because of good will. It could even be that both tendencies held but at different eras. The following picture helps. St Peter served 36 years and his successor, St Linus, served only 10. Thus the first line is at -26, indicating the successor served twenty-six years fewer. And so on for the remainder of the Popes. The little “blips” at 0 indicate successors who served identical terms to their predecessors. I can’t see any pattern, which doesn’t say too much, except that there is no pattern which strikes the eye. Counting shows that 123 successions were shorter, 17 were the same, and 122 were longer as their predecessors. The obvious and expected conclusion is that succession is a far more difficult process than captured in these simple numbers. I’m kinda disappointed that none of these statistics was referred to as a P[ope]-Value. An interesting feature of this data is that the horizontal axis position is dependent on the vertical axis value for each data point as well as the chronological order of office-holders. Hmmm. Is this data analysis in search of a theory (aka scientism, empiricism, etc -isms)? There are other implications of a Poisson process. For example the number of popes who serve in any time period follows a Poisson distribution. I knew it — the Catholics were up to no good. They caused global warming. 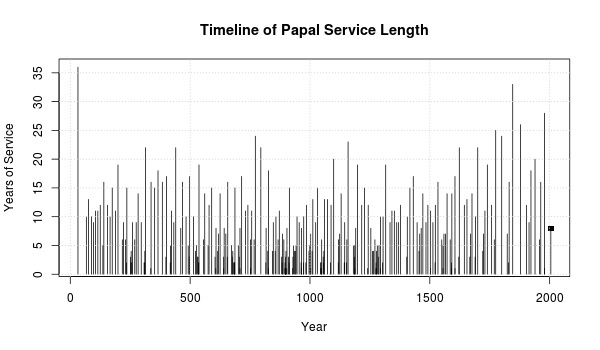 The timeline of Papal Service lenght looks like a hockey stick. Not all Catholics, just the Popes. Of course they are also helped by space aliens and the New World Order. The most intersting datum dicussed is that no Pope has served longer than Peter. Regarding Monarchs, I would guess that thier age at the time of ascention has as much to do with the lengh of thier reign than their age at the time of death. Prhaps you should also look at age at election. Life expectancy at election would be interesting, but finding numbers would be really hard. I recently heard someone say that at some point before the Renaissance there had been 70 popes in 25 years. Do you have any data about a dense frequency like that? It was also said that none of these popes died of natural causes. Any thoughts? Next Next post: Climategate 3.0—Update: Hacker A Coder?